There has not been a sacking in the Premier League so far this season but with the November international break approaching, it won’t be long before heads are rolling. Which is good news for Sam Allardyce. There were five sackings in the Premier League last November alone, while Big Sam has been hired in Autumn by a struggling Premier League club in each of the last three seasons (Sunderland, Crystal Palace, and Everton), successfully avoiding the drop every time. He has become a fire-fighting specialist, which means he will almost certainly be appointed before Christmas by an anxious club owner willing to sacrifice aesthetics for Premier League survival. But who among the current bottom five clubs, all of which could be considering a change of manager in the coming months, would be most successful with Allardyce at the helm? 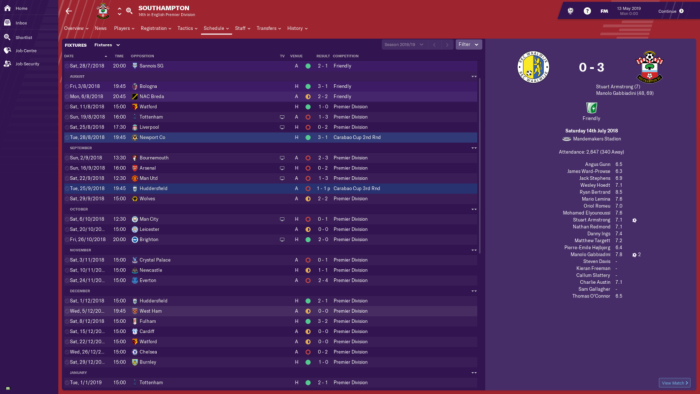 We took to Football Manager 2019 to find out. 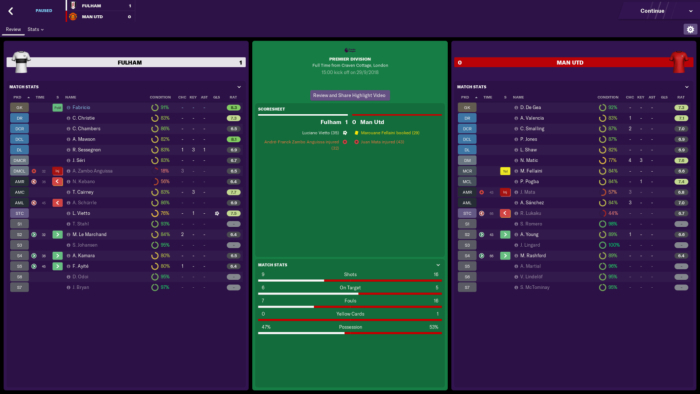 Using the FM Editor we cloned Big Sam four times, putting the five men in control of Fulham, Southampton, Cardiff, Newcastle, and Huddersfield. There’s no way to artificially manufacture the real-life league table, so Allardyce takes over in late June 2018 (with transfer windows kept closed for the first summer). The game was simmed for one year, until May 13. Clearly the Southampton board never really took to Big Sam, which is fair enough when you consider fans are already irritated by the very un-Southampton-y Mark Hughes. Saints got rid of Allardyce in early December with the club residing in the bottom three – but after a tricky run of fixtures it had looked as though Southampton were stabilising. Allardyce can feel hard done by here. Four points from the last two matches, against Huddersfield and West Ham, made it nine from the last eight – which isn’t too bad at all, especially with the club trying to rebuild confidence following defeats to Spurs, Liverpool, Arsenal, Manchester United and Manchester City in their opening eight league games. Southampton replaced Big Sam with Andres Villas-Boas, who led the team to 14th thanks to a flurry of wins at the end of the season that – adding insult to injury – relegated Allardyce’s Fulham. High point: A dominant performance and a debut goal for Danny Ings gave Southampton the perfect start with a 1-0 win over Watford. They lost their next six. Low point: When confidence is low it can sometimes feel as if everything is going against you. In a must-win game that Southampton had dominated, Christian Benteke scored an 88th-minute winner for Crystal Palace at Selhurst Park. Victory here, three weeks before the sack, and Allardyce would surely have kept his job. Things could easily have been so very, very different. After winning 15 points from the first 10 league games Allardyce had apparently proven the doubters wrong, although Fulham fans (who had enjoyed Slavisa Jokanovic’s expansive football) were obviously still aggrieved. Then it all fell apart. A miserable 18 points from their final 28 games sealed a return to the Championship – their relegation confirmed in a 3-1 home defeat to Manchester City on matchday 36 – just two weeks after it had looked as though the great escape was on. Fulham beat Southampton 3-0 in late April – their first win in 12 – to go within one point of Saints in 17th…only to lose their final three. High point: A 1-0 victory over Manchester United at Craven Cottage in September, their third successive Premier League win, was vintage Allardyce. Things collapsed pretty much immediately after this. Low point: Allardyce’s 0-0 draw at home to Allardyce’s Cardiff in February extended a run of four matches without scoring a goal. It was two points dropped that would ultimately cost them their Premier League status. How on earth Allardyce wasn’t sacked is a mystery. Cardiff went down in spectacular fashion, with just 16 points and a host of new records. They went 13 games without scoring. They failed to win a single home game. They were bottom of the table from matchday four and never left it. They scored 24 goals. And yet Cardiff were clearly an Allardyce side, conceding a surprisingly low 65 goals. 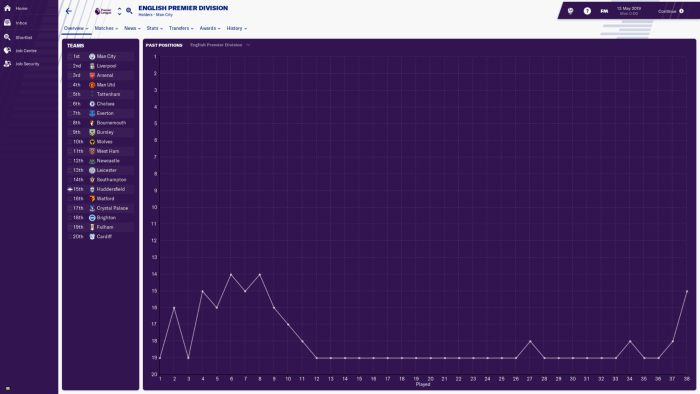 The Bluebirds only let in three or more goals on eight occasions in the league, generally losing by a one-goal margin. High point: A 2-1 win at Burnley in late October finally ended fears that Cardiff would go the entire season with victory. A late Danny Ward penalty sealed the three points in a match Burnley – with more possession, shots, and chances – should have won. The Bluebirds would win just once more, 3-1 at Huddersfield in February. 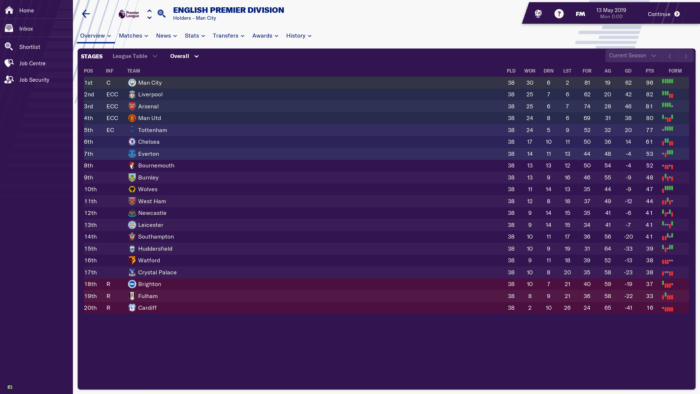 The league table might look pretty good, but it took until the penultimate game of the season for Newcastle to secure their place in the top flight. After winning once in their previous 13 league matches, it looked as though Allardyce’s Newcastle were sliding towards relegation. But Big Sam pulled off a famous 2-0 win at home to Manchester United to avoid the drop. That was undoubtedly the highlight after an appalling run through the middle of the campaign. 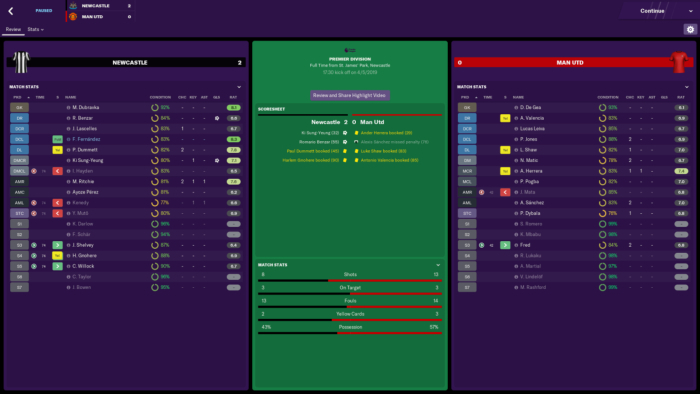 Newcastle had 11 points after five matches, only to more or less collapse in on themselves until the win against the Red Devils. High point: A 3-0 win over Burnley in September, extending an undefeated start, was the third game (out of five) in which the Magpies had scored three goals. 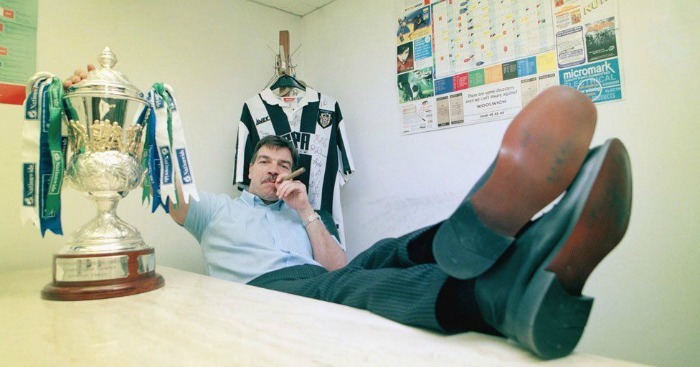 At that point it looked like Allardyce had finally sussed how to get Newcastle right. To be fair, they didn’t drop into the bottom three once the entire season. Low point: Weirdly, fan favourite Jonjo Shelvey failed to start a single game in any competition but made 24 appearances off the bench. That must have been extremely annoying for everyone involved. The most dramatic Allardyce story came at Huddersfield, where his all-but-doomed side somehow came back from the brink to survive relegation on the final day of the season. A Nigel Pearson-esque run of 10 points from the final five fixtures boosted the Terriers up into 15th, two points above the drop zone on 39 points. Huddersfield spent a total of 27 consecutive weeks in the bottom three, slumping in on matchday 11 and only rising above the dotted line on the final day. Miraculous. High point: A 2-1 win at Palace on the last day did the job, courtesy of goals from Alex Pritchard and Dario Lezcano. Low point: A 3-1 loss at Allardyce’s Newcastle on the opening day was a pretty ominous sign, triggering a terrible first half of the campaign in which Huddersfield didn’t record a home win until mid-December. Can you name every team to be relegated from the Premier League?